Summer is coming to an end and it’s time for kids to go back to school. September is a great time for new beginnings. With that in mind, I want to share one of my smaller remodel projects with you. 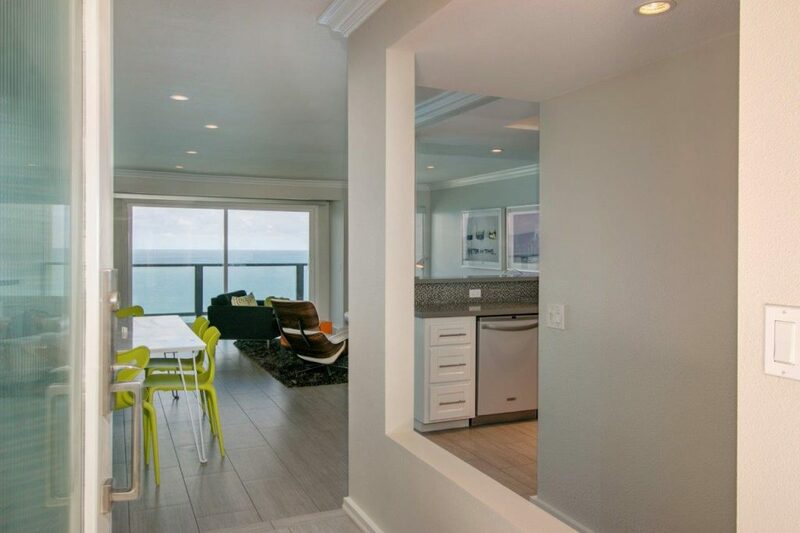 In this contemporary before and after, we remodeled this small 1100sf ocean front condo in 2 phases. 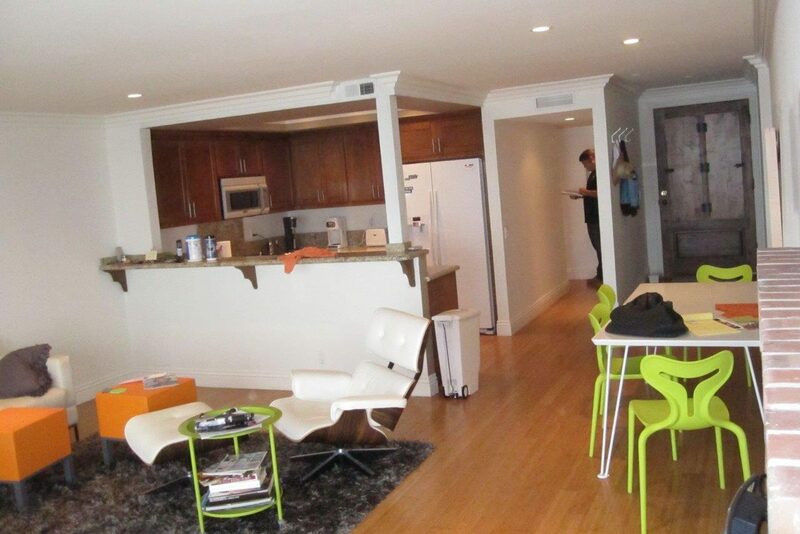 In the first phase we refreshed the kitchen, tiled the floor and replaced the fireplace. In an effort to keep costs in check we decided to paint the existing cabinets. 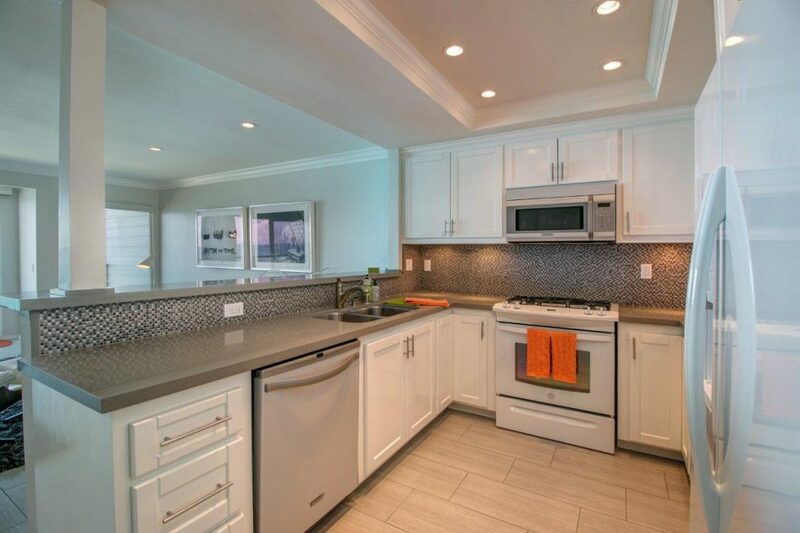 Existing white appliances dictated our selection of gloss white which gave us a built-in look without the cost. While I don’t normally recommend keeping older cabinetry because of glides, melamine boxes and generally poorer construction in many cases, repainting worked in this situation because my clients were truly looking for a face-lift and were not using the kitchen for preparing elaborate meals daily. 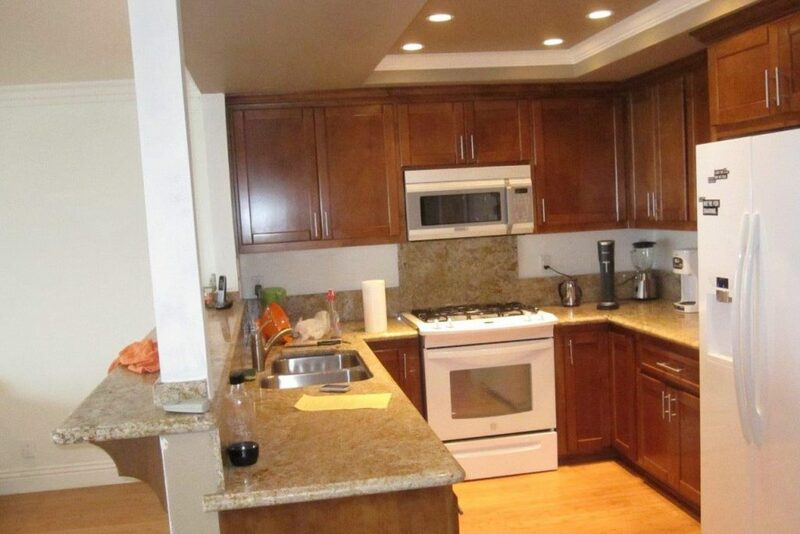 Most of my clients are into cooking and are looking for chef-like kitchens but this was not the case here. To add some visual interest to what would have been a very stark kitchen, visible from the dining and living rooms, we changed out the counter tops and added this gorgeous masculine metallic back-splash. 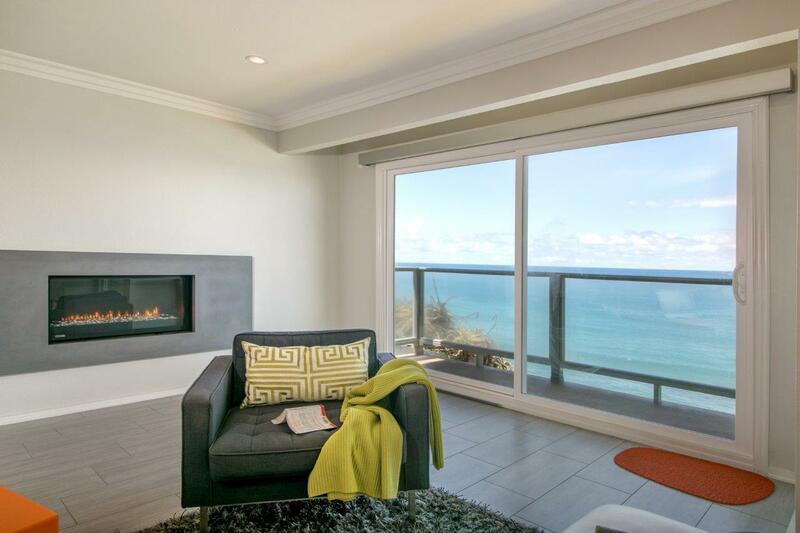 This cliff side condo is a weekend get away for my clients based in LA. They go to the beach regularly with their 2 girls and were concerned about wood floors and sand. 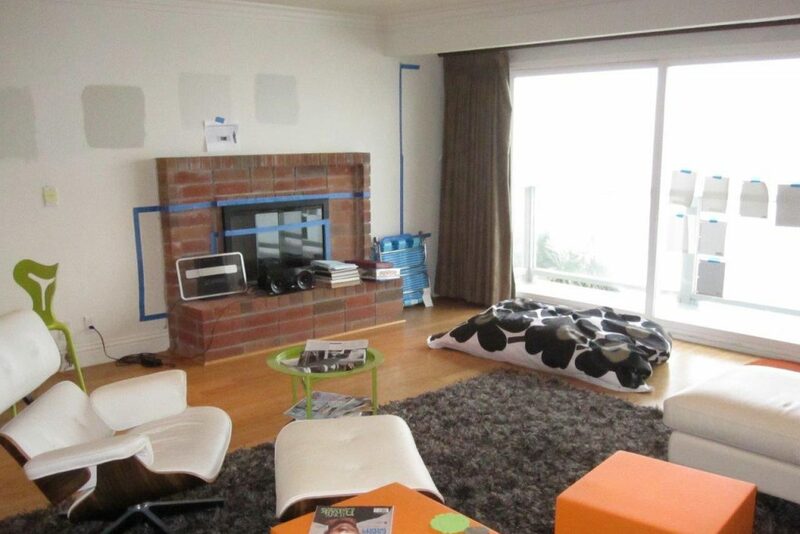 We were initially going to forgo redoing the floor until we discussed how to handle the fireplace hearth (see below). 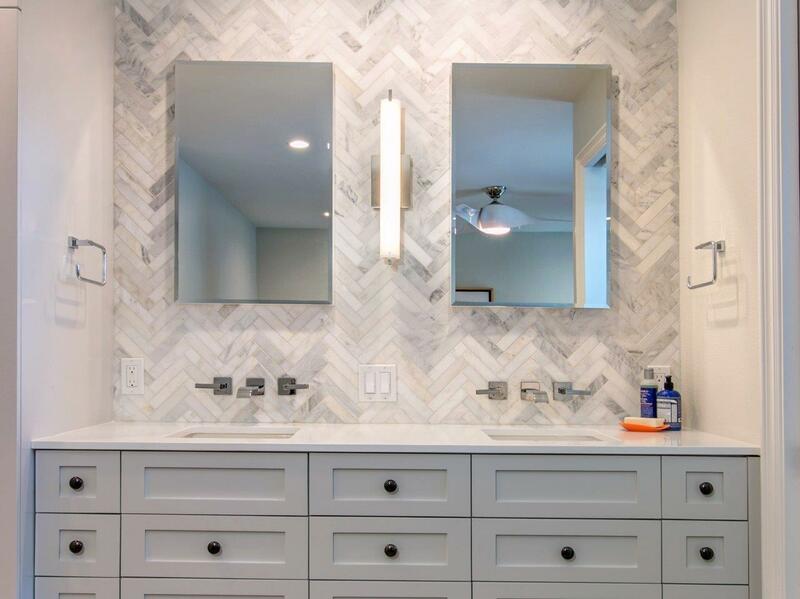 When I presented a 12×24 gray and white striated porcelain tile, that would give my clients their contemporary look plus the durability they wanted for beach side living, it was a no brainer. This hideous fireplace prompted this remodel. 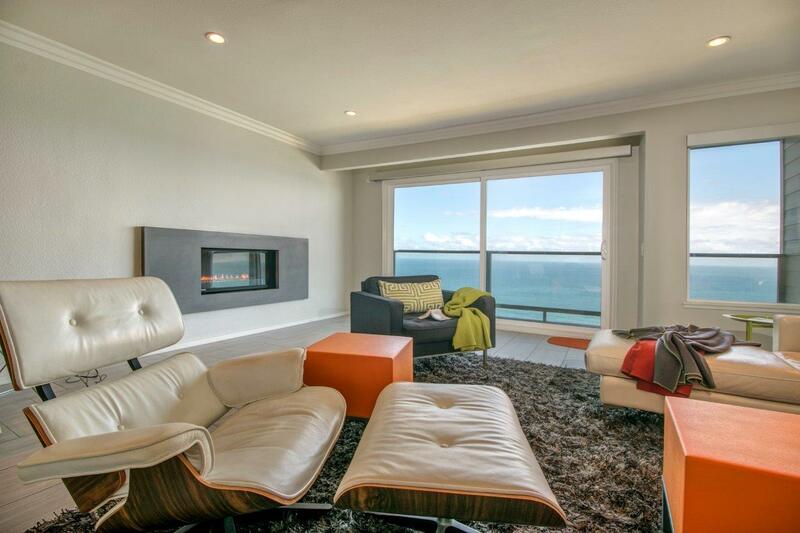 The dated, protruding brick fireplace did not match the contemporary style my clients wanted in their get away home. 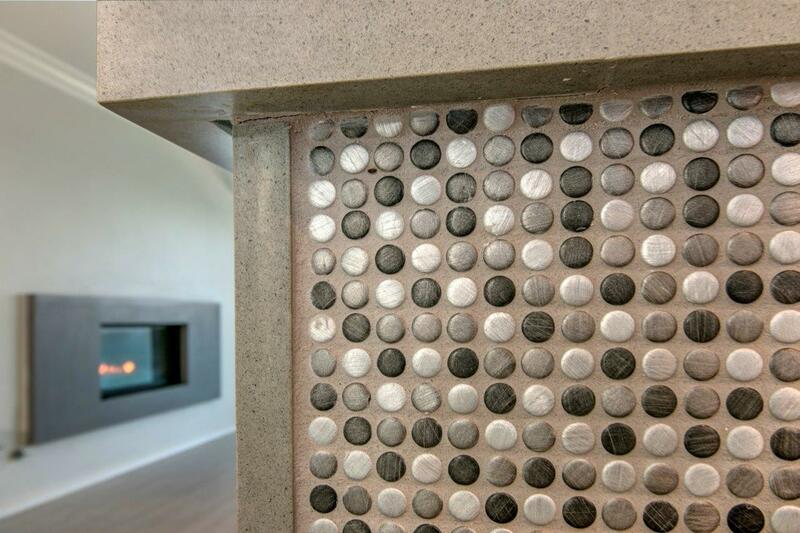 To give them the sleek contemporary look they were interested in, we replaced the firebox with a longer linear gas firebox and created a floating, poured concrete surround. If you remember from above, we contemplated how to handle the hearth which needs to be noncombustible to meet fire code. By tiling the floor, we met fire code for our hearth and had a seamless transition that didn’t interrupt the visual of the floor allowing the fireplace to be the focal point. Look for Phase 2 of this remodel in October when I show you what we did to the bathrooms and master bedroom. What a nice transformation! Your clients must really love coming home to this now.